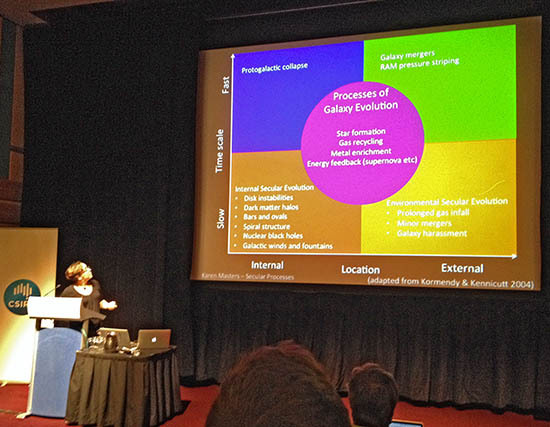 This week much of the team has been in Sydney, Australia, for the Evolutionary Paths In Galaxy Morphology conference. 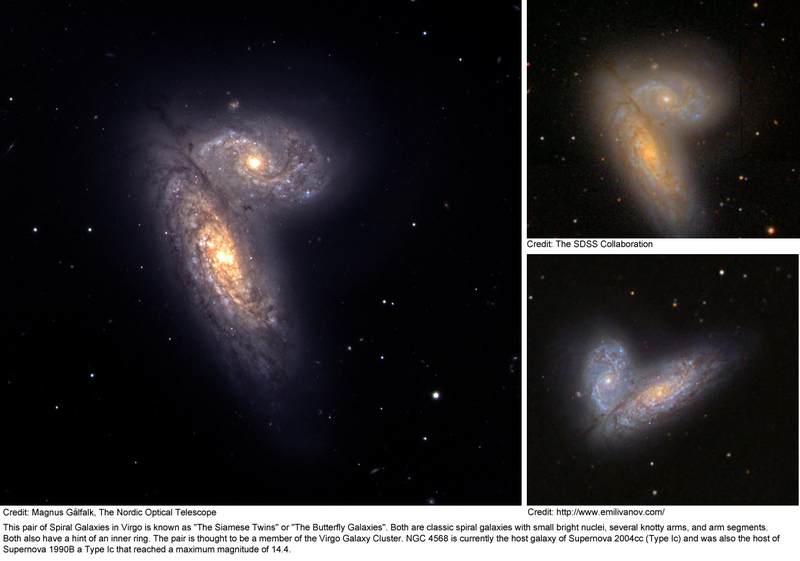 It’s a meeting centered largely around Galaxy Zoo, but it’s more generally about galaxy evolution, and how Galaxy Zoo fits into our overall (ever unfolding) picture of galaxy evolution. There’s a lot to that legacy already, and it’s still being written. The first talk of the conference was a public talk by Chris, fitting for a project that would not have been possible without public participation. Chris also gave a science talk later in the conference, summarizing many of the different results from Galaxy Zoo (and with a focus on presenting the results of team members who couldn’t be at the meeting). For me, Karen’s talk describing secular galaxy evolution and detailing the various recent results that have led us to believe “slow” evolution is very important was a highlight of Tuesday, and the audience questions seemed to express a wish that she could have gone on for longer to tie even more of it together. When the scientists at a conference want you to keep going after your 30 minutes are up, you know you’ve given a good talk. 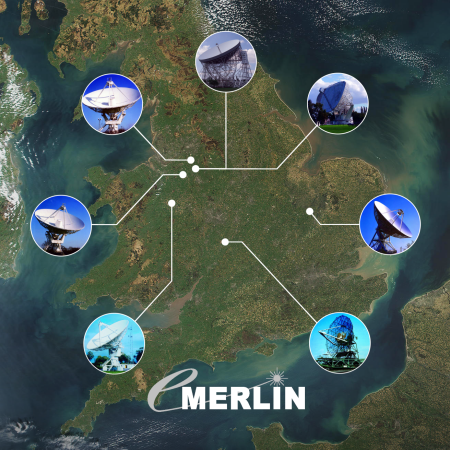 In fact, all of the talks from team members were very well received, and over the course of the week so far we’ve seen how our results compare to and complement those of others, some using Galaxy Zoo data, some not. 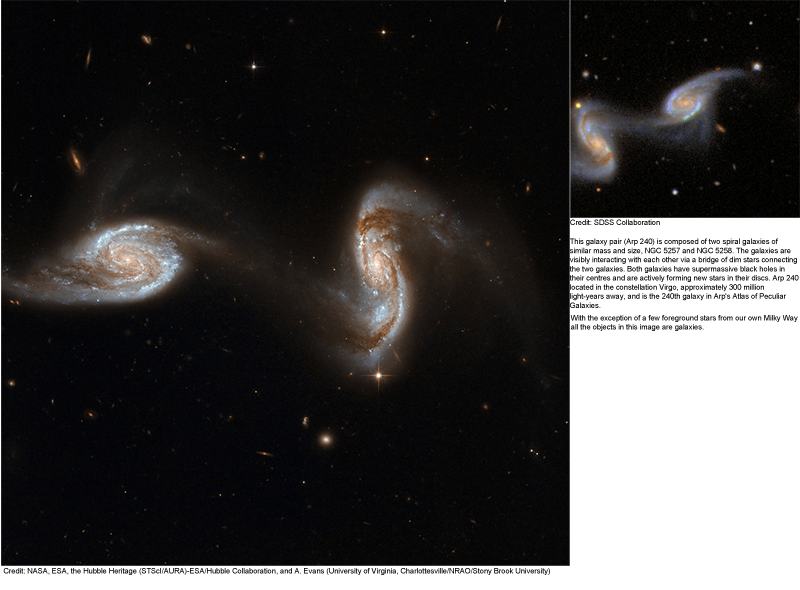 We’ve had a number of interesting talks describing the sometimes surprising ways the motions of stars and gas in galaxies compare with the visual morphologies. Where (and how bright) the stars and dust are in a galaxy doesn’t always give clues to the shape of the stars’ orbits, nor the extent and configuration of the gas that often makes up a large fraction of a galaxy’s mass. Karen explains her simple and clear diagram showing different galaxy evolutionary processes. 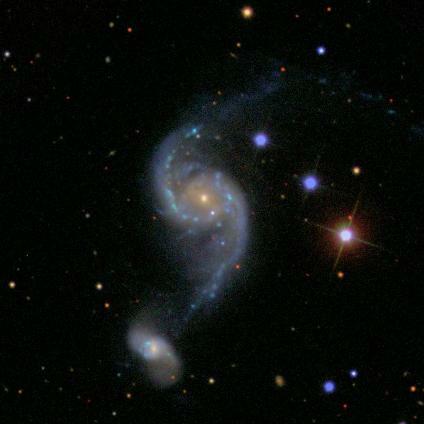 This goes the other way, too: knowing the velocities of stars and gas in a galaxy doesn’t necessarily tell you what kinds of stars they are, how they got there, or what they’re doing right now. 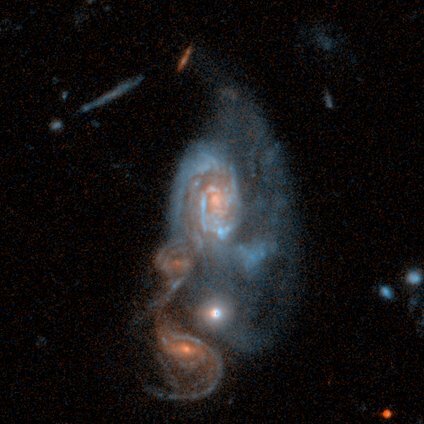 I suspect a combination of this kinematic information with the image information (at visual and other wavelengths) will in the future be a more often used and more powerful diagnostic tool for galaxies than either alone. I’m sure that, if any tears were shed, they were tears of joy. This is a great project and it’s only getting better. 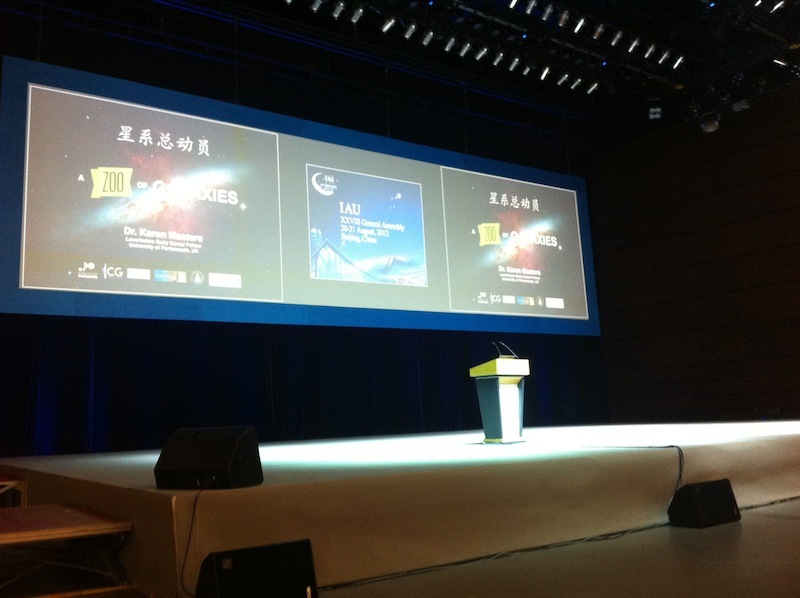 The first time I gave a public talk, I spent an hour describing why galaxy classification is fundamentally important to the study of the Universe, the origins of Galaxy Zoo, the amazing response of the volunteers and the diverse results from their collective classifications of a million galaxies near and far. 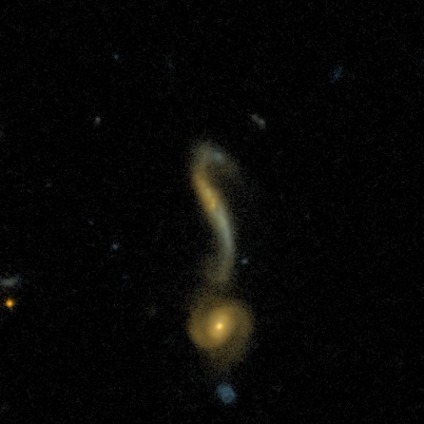 I showed many gorgeous galaxy images, a few dark matter simulations and even a preview of the Hubble image of Hanny’s Voorwerp. 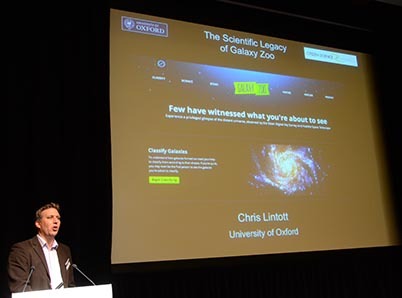 As I finished my talk and the Q&A began, I braced myself for the inevitably interesting and challenging questions (I seem to get a lot of questions about black holes and spacetime). Oops. Apparently I’d forgotten that little detail at the start of the talk. 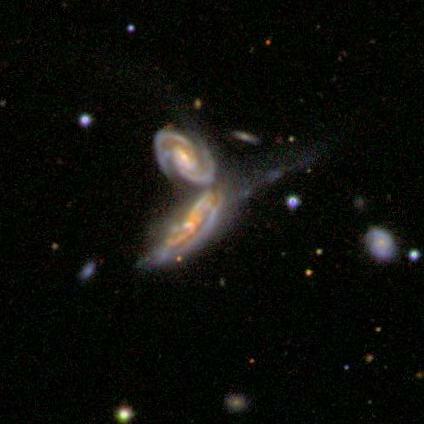 So I described a typical galaxy (if there is such a thing): a collection of stars, gas, dust, dark matter, all gravitationally bound together. Then I made a joke about scientists forgetting to define their terms, and we moved on to the next raised hand. Turns out, though, it’s not such an easy question. 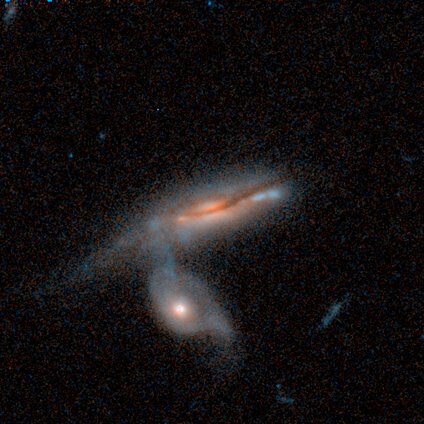 Even though my casual definition works fine for most galaxies, it’s not at all an agreed-upon standard. We’ve discussed this on the blog before, and even in the short time (astronomically speaking) since Karen wrote that very nice post, more work has been done to find galaxies that push the boundaries and force us to re-think what it really means to be a galaxy. 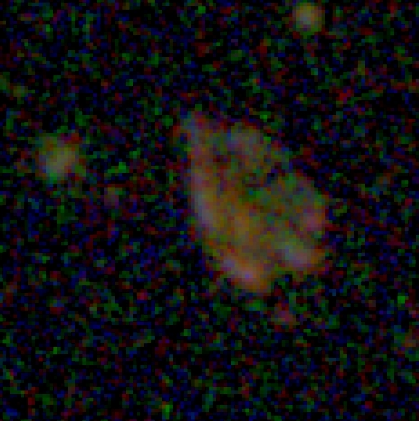 The circled stars (plus a lot of dark matter you can’t see) are Segue 1, one of the smallest galaxies we know about. To read more on this, click the image. 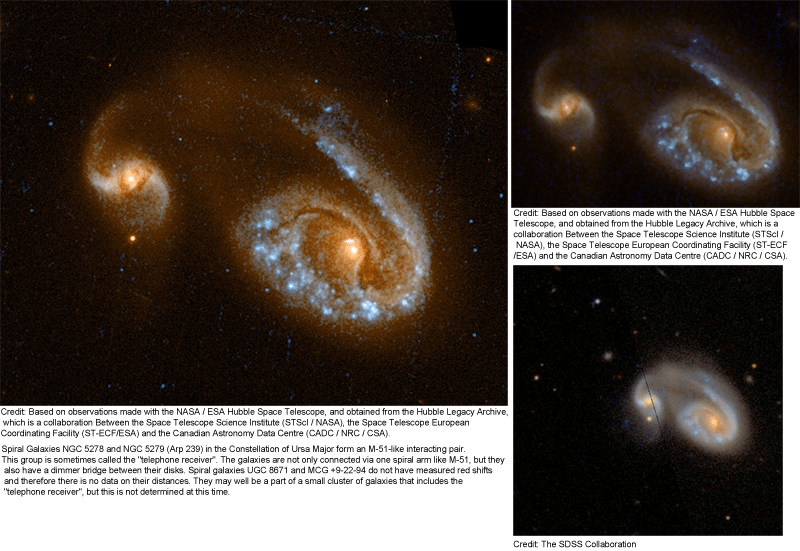 So, spurred by a very broad interpretation of a question left for us in the comments on the post announcing this hangout, we decided to re-visit the discussion, covering the various properties a galaxy must have, should have, could have, and can’t have. We discussed the smallest galaxies, found by counting and measuring each of their individual stars. We discussed the biggest, brightest galaxies in the universe, living in rich environments and grown fat by eating other galaxies. And everything in between. 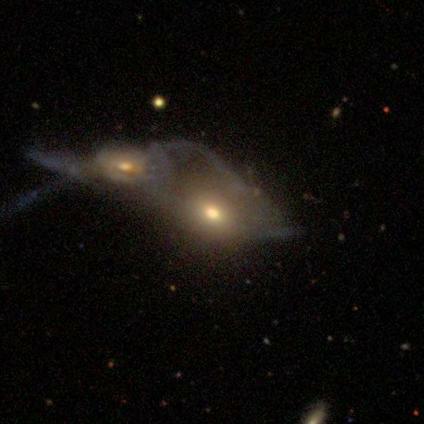 Note: when we talk about Segue 1 and 2, I say that these galaxies are unique because they have low mass-to-light ratios. Despite the pause that indicated I was trying to keep from inverting numerator and denominator… that’s exactly what I did. 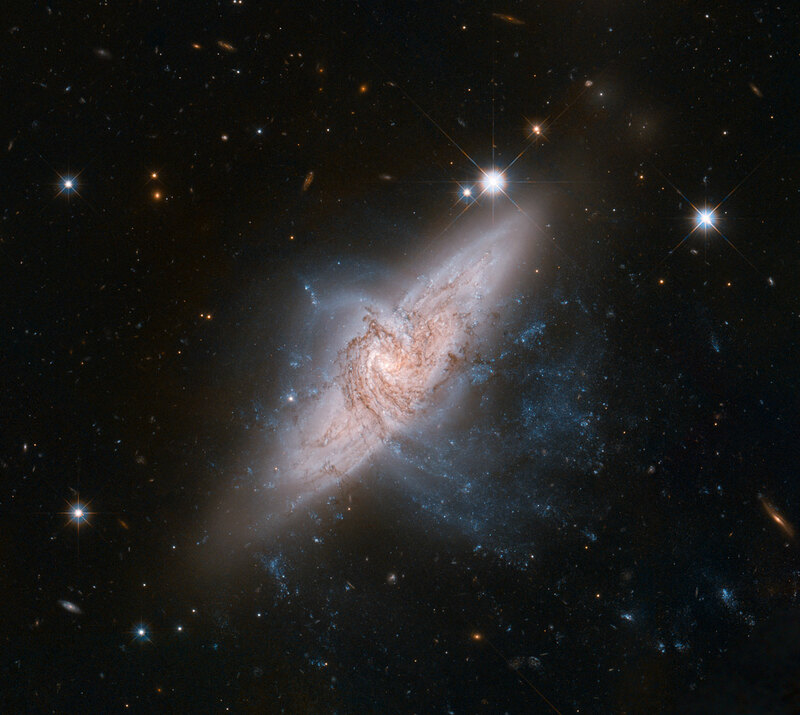 The galaxies have very few stars compared to the amount of dark matter in them, so their mass is high and their light is low, so their mass-to-light ratios are high. Oops (again)! Jargon Alert: Your IMF Just Messed With My SPS! I remember going to a lecture as an undergraduate wherein my professor compared what astronomers do to a hypothetical alien crew on a fast-moving ship that can only take one photo of the Earth as it passes by. We can assume they have a special camera that can see through buildings, but otherwise they just get one photo of, say, a major city, and from that they have to try and learn as much as they can about the human race. How hard would it be to discover that our species has two genders? Or that both of them are required to propagate the species, but only one gives birth? Would it be possible to figure out the whole human life cycle? To discover what disease is? To distinguish between genetics and culture (nature and nurture)? Just having one picture is limiting, but with careful study you can learn more than you think. One of the most fundamental plots in astronomy. The professor was drawing an analogy with the Hertzsprung-Russell diagram in particular, which we’ve talked about before on our hangouts: to make it, you record the color and the luminosity of all the stars you can and plot them up against each other, one point per star. The stars group together in interesting ways in particular areas of the diagram, and it turns out that from this diagram alone you can recover an enormous amount about the life cycles of a population of stars (for example, in a star cluster, a neighborhood of our own galaxy, or a nearby galaxy). You can learn even more if you couple the diagram with spectra of stars from different parts of it. Studying stellar populations has helped us understand the fundamentals of what kinds of stars exist, how they are born and die, and how many stars of any given mass are likely to develop in a galaxy in relation to stars of different masses. That last thing is called the Initial Mass Function (IMF for short). Essentially it says that, when stars form in groups, more low-mass stars form than high-mass stars. Put that together with what we know about how much brighter high-mass stars shine and how much faster they die than low-mass stars, and you can start to understand how whole populations of stars in galaxies form and evolve. 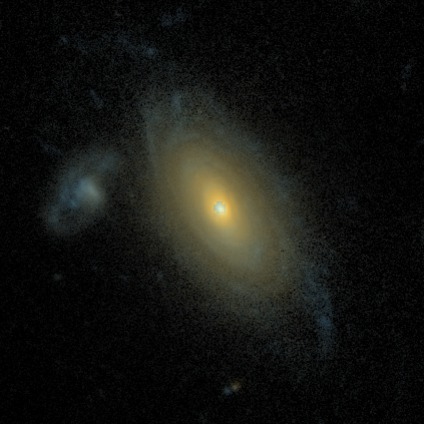 And we can apply our studies of nearby galaxies and groups of stars to galaxies we observe much farther away. 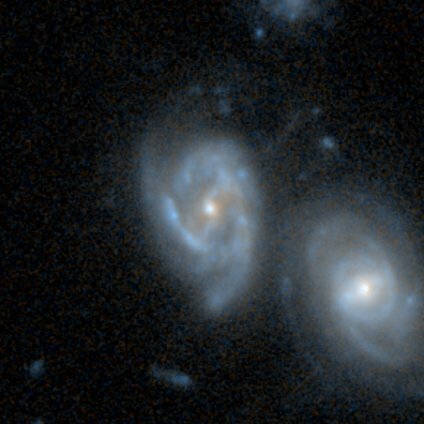 It’s a good thing, too, since most galaxies are far enough away that our current telescopes can’t resolve individual stars. We just get the sum of the light from all the stars. 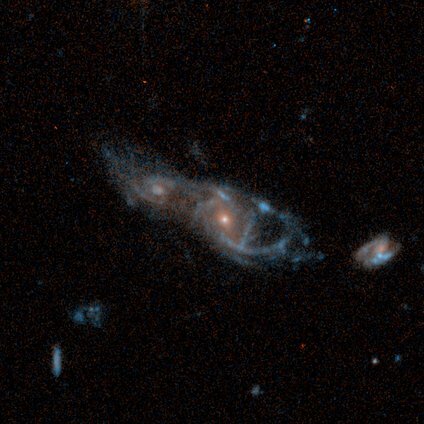 That combined light is sometimes made up of multiple populations of stars that formed in groups at different times and now all live together in a particular galaxy. Taking that single picture combining the light from billions (often hundreds of billions) of stars and using it to learn about the stars’ masses, ages and histories is an important process, and there are several ways to do it: one way combines models of stellar populations made by forming and evolving many stars in a computer simulation. This is sometimes called Stellar Population Synthesis, or SPS. 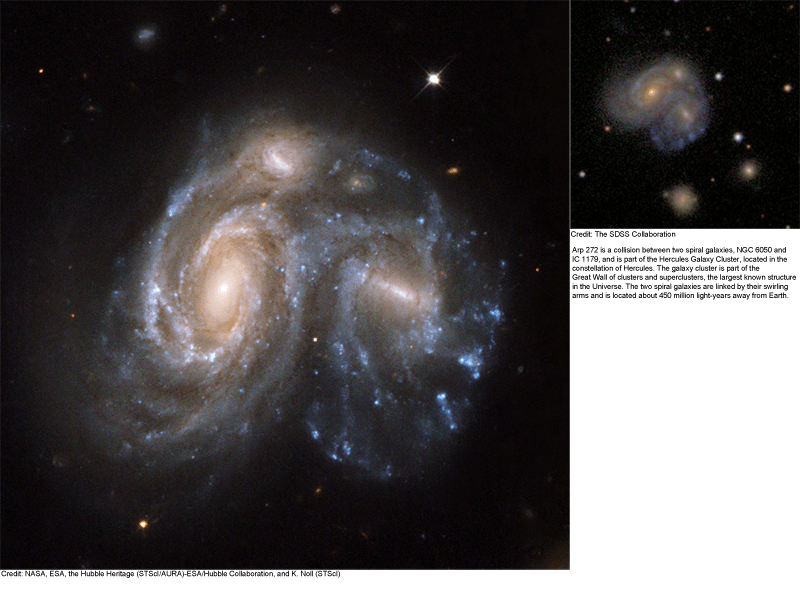 On today’s live Hangout, we once again let your questions guide us as we talked about IMFs and what they have to do with SPS and measuring the stellar masses of galaxies. The work that laid the foundations for today’s study of galaxy stellar populations was done in large part by women (Bill mentioned Beatrice Tinsley, for example), which is fitting since today is International Women’s Day. We talked about that too, and about diversity in general in astronomy. 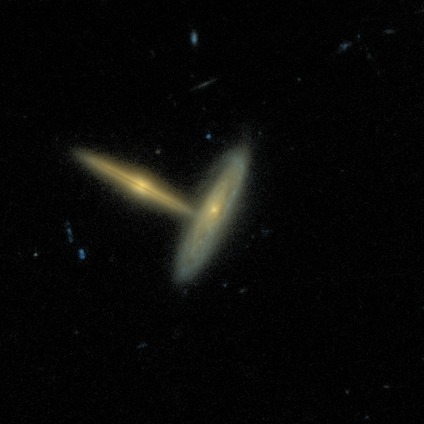 Just as you can learn a lot from even one snapshot of a galaxy, you can do a lot with just a bit of mindfulness about being an ally for diversity (Kyle noted on Twitter that World Day for Cultural Diversity is May 21), be it equality for women or for any other minority groups in science, or indeed any field. Here’s the audio-only version of the Hangout: click to listen to mp3 version. We’ll post about our next hangout soon; in the meantime, keep those questions coming! I’m posting this for Karen Masters, since she’s behind the great firewall. 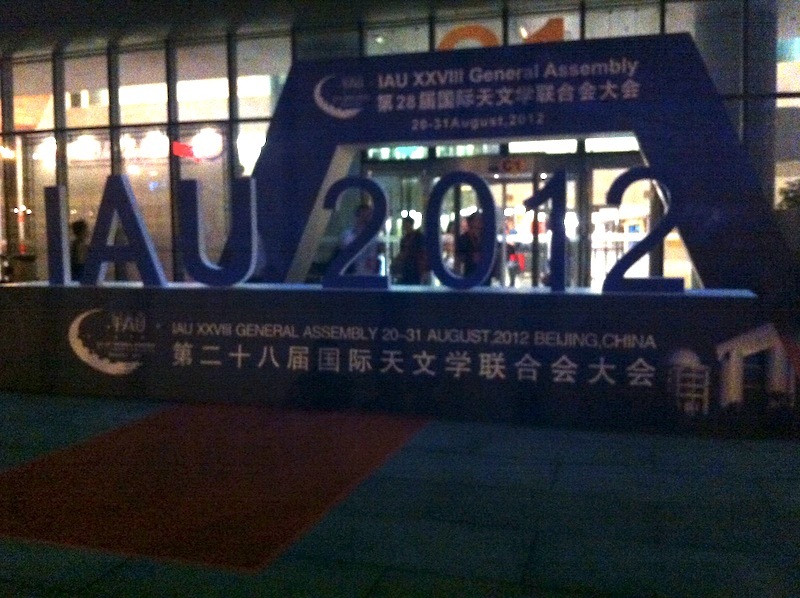 Hello from a hot and smoggy Beijing where I will be spending the next 2 weeks attending the 28th General Assembly of the International Astronomical Union (the IAU, most famous perhaps as the people who demoted Pluto). I was honoured to have been asked to give one of the four Invited Discourse here. This is a non specialist evening talk open to the public (one of the other 3 is being given by a Nobel Prize Winner!) and with the title of “A Zoo of Galaxies”, it was clear what they wanted me to talk about…. Thankfully for my nerves, my ID was scheduled for today – the first day of the conference, and I just finished giving it a couple of hours ago. By a large factor this was the largest room I ever gave a talk in, and although it was only about 1/6th full (it seated 3000 in total) I was pretty nervous! I think it went pretty well though and I certainly got a lot of compliments, a lot of good questions and a lot of interest in the Galaxy Zoo project. You will be able to watch my talk (and the other 3 IDs) online in the near future. I will upload the link when I have it. 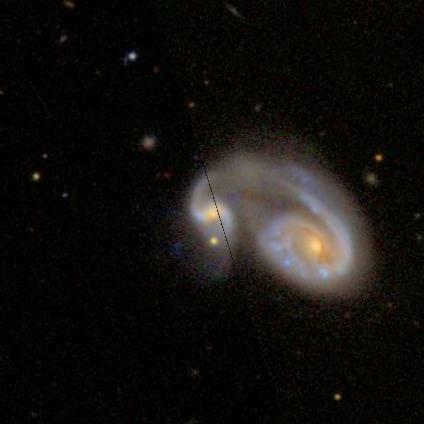 Today was a busy day, because I not only gave that talk at a green coffee shop, I also gave a much shorter contributed (science) talk on my most recent research using Galaxy Zoo classifications (https://blog.galaxyzoo.org/2012/05/25/new-paper-on-the-galaxy-zoo-bars-accepted-to-mnras/). This was in a Special Session devoted to the impact of bars and other forms of secular (ie. 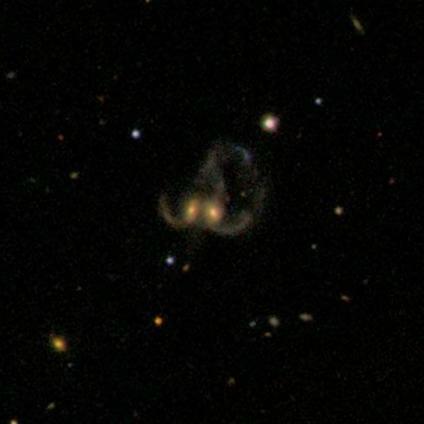 slow, and usual internal) evolution on galaxies which was absolutely fantastic, and I have another 4 days of this session still to enjoy. 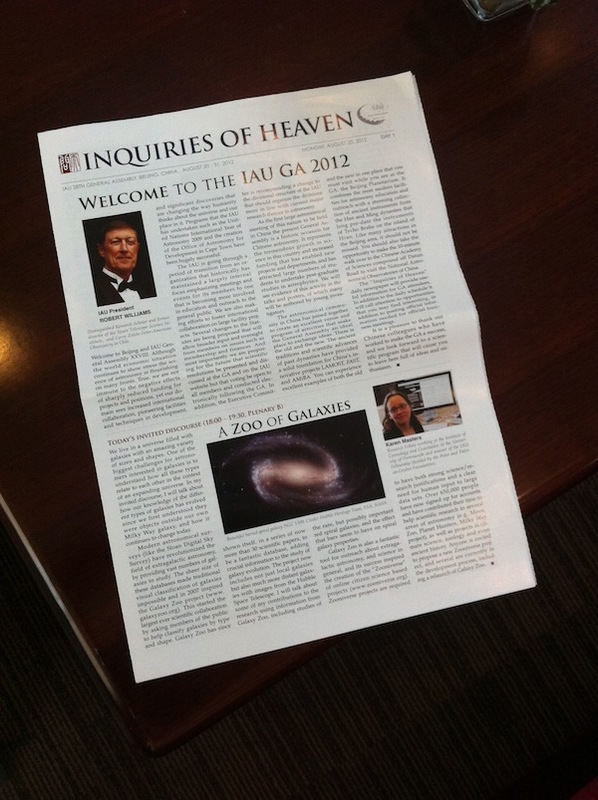 Galaxy Zoo featured prominently on the first page of today’s IAU newspaper. Now I get to relax and just attend the meeting for a few days….. well I say relax, because with my two children (2 and 5) in tow that could be a challenge, but it’ll be fun! They get to attend the UNAWE Childrens Workshop (http://www.unawe.org/) while we are here – their very own mini-astronomy conference! 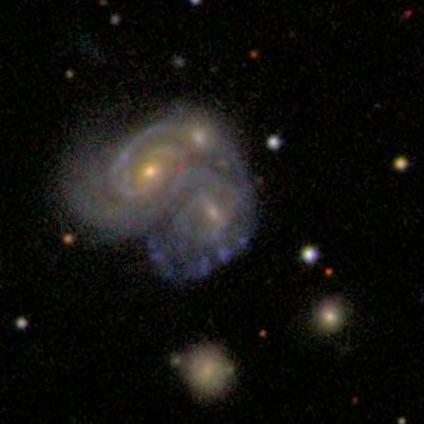 We’re taking a few days off next week for a family holiday in Hong Kong, but then I’ll be back on the last day of the meeting for yet another talk on Galaxy Zoo – this an invited talk to a session devoted to dealing with large surveys in which the organisers wanted me to talk about using projects like Galaxy Zoo as a tool for outreach. I hope you all had clear skies during the Transit of Venus. If not, it’ll be over a hundred years before you get another chance…. and in Zoo-related news, the Transit of Venus is an example of one way we find planets around other stars. We look for a dip in the brightness of the star as a planet moves across it from our point of view. Want to know more? Head over to the Planethunters blog, or put in some clicks looking for transits yourself! 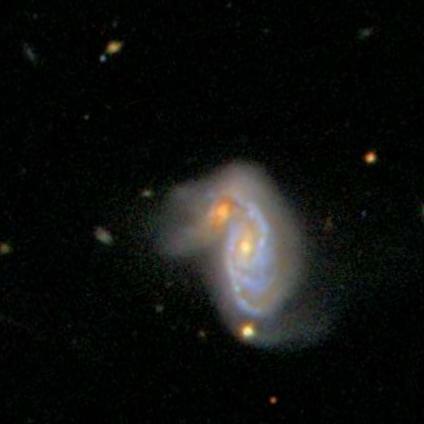 So, in actual Galaxy Zoo news, I am very happy to report that the latest Galaxy Zoo study has been accepted for publication in the Astrophysical Journal. 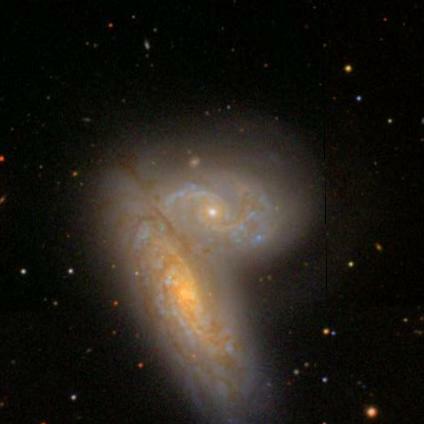 As we blogged a while back, we got Chandra X-ray time to observe a small sample of major mergers found by the Galaxy Zoo to look for double black holes. 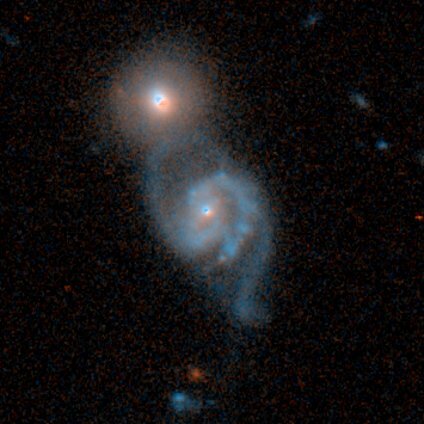 The idea is to look for the two black holes presumably brought into the merger by the two galaxies and see if we find both of them feeding by looking for them with an X-ray telescope (i.e. 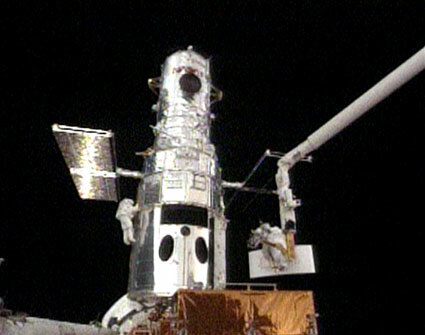 Chandra). The lead author of the paper is Stacy Teng, a NASA postdoctoral fellow at NASA’s Goddard Space Flight Center and an expert on X-ray data analysis. 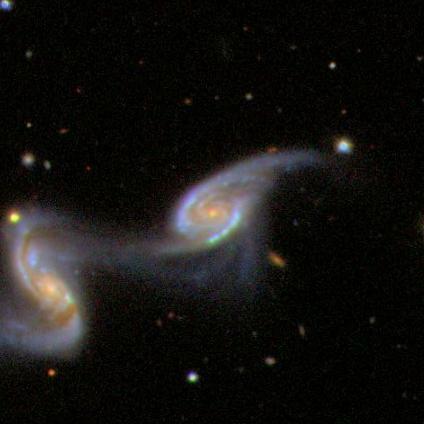 In a sample of 12 merging galaxies, we find just one double active nucleus. 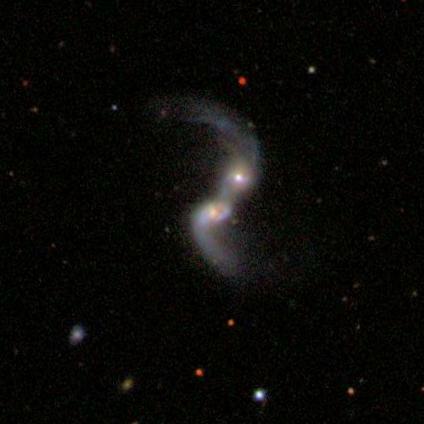 Image of the one merger with two feeding black holes. 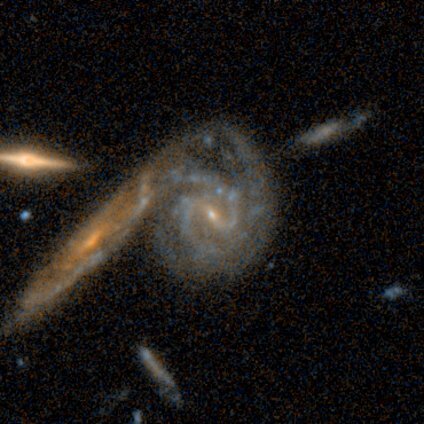 The white contours are the optical (SDSS) image while the pixels are X-rays. The red pixels are soft (low energy) X-ray photons, while the blue are hard (high energy) photons. 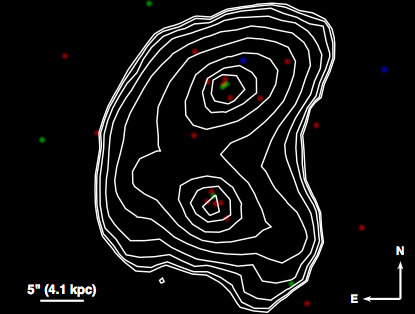 You can see that both nuclei of the merger are visible in X-rays emitted by feeding supermassive black holes. 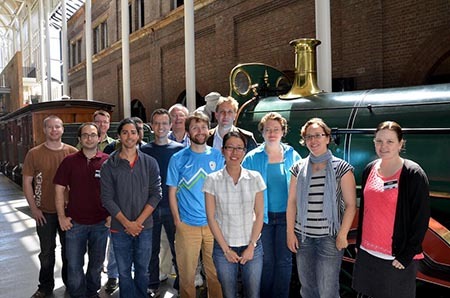 We submitted the resulting paper to the Astrophysical Journal where it underwent peer review. The reviewer suggested some changes and clarifications and so the paper was accepted for publication. You can find the full paper in a variety of formats, including PDF, on the arxiv. So what’s next? We submitted a proposal, led by Stacy, for the current Chandra cycle. 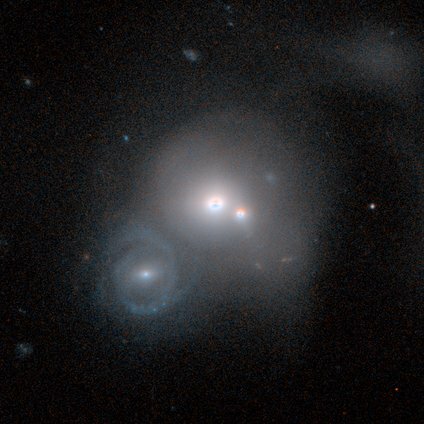 To do a bigger, more comprehensive search for double black holes in mergers to put some real constraints on their abundance and properties. We hope to hear about whether the proposal is approved some time later this summer, so stay tuned and follow us on Twitter for breaking news!